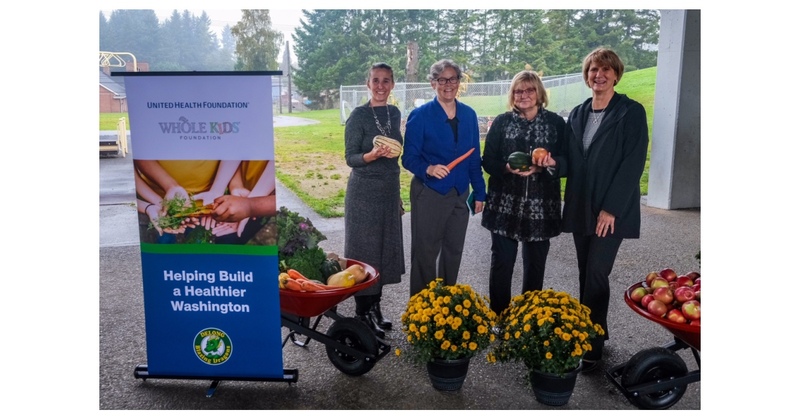 TACOMA, Wash.–(BUSINESS WIRE)–Washington’s First Lady Trudi Inslee joined the United Health Foundation and Whole Kids Foundation for a grant presentation and roundtable discussion at DeLong Elementary School in Tacoma today. The United Health Foundation and Whole Kids Foundation announced 24 grants, totaling $48,000, to Washington schools to develop or expand existing vegetable gardens or beehives, and provide educational resources about agriculture, caring for the environment and maintaining healthy lifestyles. First Lady Trudi Inslee, Whole Kids Foundation’s Nona Evans, UnitedHealthcare Pacific Northwest States CEO Claire Verity, and other education and health care leaders hosted a discussion about health challenges facing Washington communities, including food insecurity, obesity and other social determinants of health, and possible local solutions to address these challenges. Studies show that school gardening, combined with a healthy lunch program or nutrition education, encourages healthier food choices. Children are also more likely to eat fruits and vegetables they have grown themselves.